Today marks the anniversary of the virtual annihilation of the Jewish community of Crete in 1944. Early on the morning of 9 June 1944, the Greek freighter Tanais – which was carrying 265 people, the entire Jewish community of Crete – was torpedoed before it reached the port of Piraeus. Jews had settled here in Crete long before the Christian era, and there are early references to the Jews in Gortynia, Crete, in I Maccabees 15: 23. A letter from Shimon the Maccabee sent to the ruler of Crete in 142 BCE expressing support for the local Jews. Philo of Alexandria speaks of the Jews of Crete. Josephus, the Jewish historian from the end of the Second Temple period, married a Jewish Cretan. He notes that ca 4 BC the false Alexander, on his way to Rome, visited the Jewish communities of Crete. They accepted him as a member of the Hasmonean dynasty and gave him large sums of money. A few decades later, the New Testament records Cretan Jews living in Jerusalem at the time of the Pentecost(Acts 2: 11). The Emperor Theodosius II expelled Jews from Crete in 408, but many families must have soon returned, because in 440 many Jews in Crete accepted the claims of Moses of Crete, a self-proclaimed Messiah. 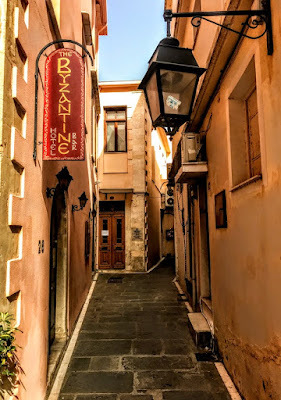 The Jewish communities of Crete may have survived the Byzantine and Saracen periods, and there probably was a Jewish presence in Crete when the island became a possession of Venice in 1204. The Jews of Rethymnon are noted in 1222, when there is an indirect reference to them during a Greek rebellion against the Venetians. Some documents give 1228 as the date for the foundation of a synagogue in Crete, although this may be an error and the date may be 1328. By 1320, the Jewish community in Rethymnon lived in the old burgus or suburb, outside the Byzantine city. Sabateus Capsali, the Jewish owner of several houses abutting the walls of the suburb, was then authorised to open windows in this wall by Pietro Bragadin, the rector or governor of Rethymnon. Some time later, two Jews were granted vacant land on the other side of the wall, in parte exterior dicti burgi … extra burgum, and allowed to build houses. Later they received permission to build them along the wall where Capsali had opened the windows. The Jewish community of Rethymnon had its own institutions well before 1362, when it adopted an ordinance separating two ritual functions, the synagogue cantor and the animal slaughterer. There was a Jewish quarter in Rethymnon by 1386, when a request was made to reopen the synagogue in the Judaica that had been closed by Pietro Grimani. In return, they were required to pay towards the expenses of building the port. Following the Spanish massacres of 1391, a significant number of Sephardic Jews arrived in Venetian Crete having fled Iberia for the eastern Mediterranean. They were soon joined by more exiles from Venice in 1394 and then from Germany. Although there were tensions between the leadership of the original Romaniot Jews of Crete and the new Sephardic arrivals, the two communities soon intermarried and over time the Jews of Crete were strongly influenced by Sephardic intellectual traditions. Meanwhile, in 1392, the Jews of Rethymnon were required to supply 12 men to guard the ramparts near the ghetto, but this order was rescinded in 1395 in return for a payment. There is a reference to this Jewish quarter in a resolution of the Venetian Senate in 1412, when there was a complaint that Jews owned all the shops in Rethymnon. Solomon, son of Lazzar da Meïr, had secured permission for himself and his descendants to open shops in any part of Rethymnon, and the concession was immediately revoked. It was recorded in 1421 that Cherson, a son of Solomon of Rethymnon, owed a considerable sum of money to three Christian noblemen. 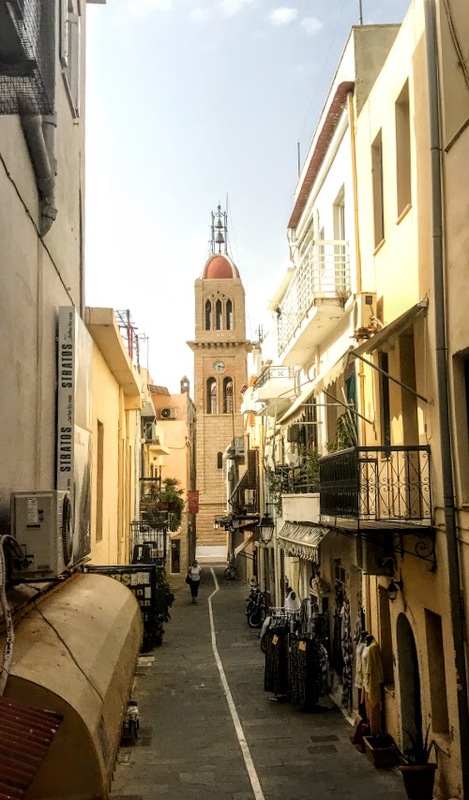 The boundaries of the Jewish quarter were marked by crosses in 1448, probably as a direct challenge to the faith of the residents by the Christian rulers of Rethymnon. The Jewish population of Crete in the 15th century has been estimated at 1,160. The Capsali family, which had lived in Rethymnon from the 14th century or earlier, included leading rabbis such as Moses ben Elijah Capsali (1420–1495), Elijah Capsali (ca 1483–1555) and Elkanah Capsali. Moses Capsali became Hakham Bashi or Chief Rabbi of the Ottoman Empire, while Elijah Capsali later wrote histories of Crete and Venice. When large numbers of exiles fleeing the Spanish Inquisition arrived at the beginning of the 16th century, the Jewish communities of Crete sold the golden ornaments in their synagogues to raise money to free many exiles being kept on board by ships’ captains who claimed their passengers as slaves. After the Turks captured Rethymnon in 1647, it is said, the Jewish population left the city for economic reasons. But the Jewish communities survived in Iraklion and Chania. On the advice of the Chief Rabbi of Crete, Moses Ashkenazi, all Jews who were Greek subjects formally adopted Ottoman nationality in 1869. At the beginning of the Greco-Turkish war in 1897, there were 225 Jewish families in Crete, including five families in Rethymnon. But Ottoman Turkish rule had brought economic hardship and a loss of progressive intellectual life for the Jews of Crete, and the Jewish communities in Rethymnon, Chania and Iraklion declined significantly. Many Jewish families left Crete and moved to Venice and other parts of Italy and to other Jewish enclaves in the Mediterranean, such as Gibraltar, Istanbul and Thessaloniki. Some of the remaining Jews managed to escape Crete before the Nazi occupation of the island. During World War II, the Germans occupied Crete in 1941. They ordered a census of the remaining Jews on the island, and found 314 Jews in Chania and 26 in Iraklion. The Gestapo rounded up the last 265 Jews living on Crete on 29 May 1944, in the middle of the night. After a few days in inhumane conditions, these 265 Jews were transferred by trucks to Iraklion. It took several hours. Early on the morning of 9 June 1944, they were all herded onto the Tanais, a cargo ship headed for the Greek mainland and Piraeus, the port of Athens. Among them were Rabbi Elias Osmos, the last rabbi of Crete, and 88 children. Their final destination was Auschwitz. But they were spared the gas chambers in a cruel twist: the British submarine HMS Vivid hit the ship with four torpedoes not far from the coast of Santorini. In all, about 1,000 prisoners were on board, including 400 Greek hostages and 300 Italian soldiers. No one survived. 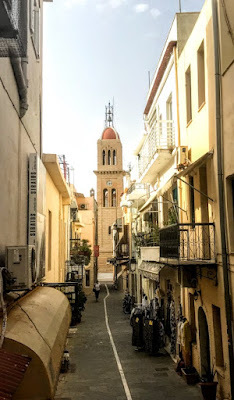 On Friday evening [8 June 2018], as I strolled through the narrow streets and alleys of the old Venetian parts of Rethymnon, I could find no traces of the Jewish quarter or any of the former synagogues. 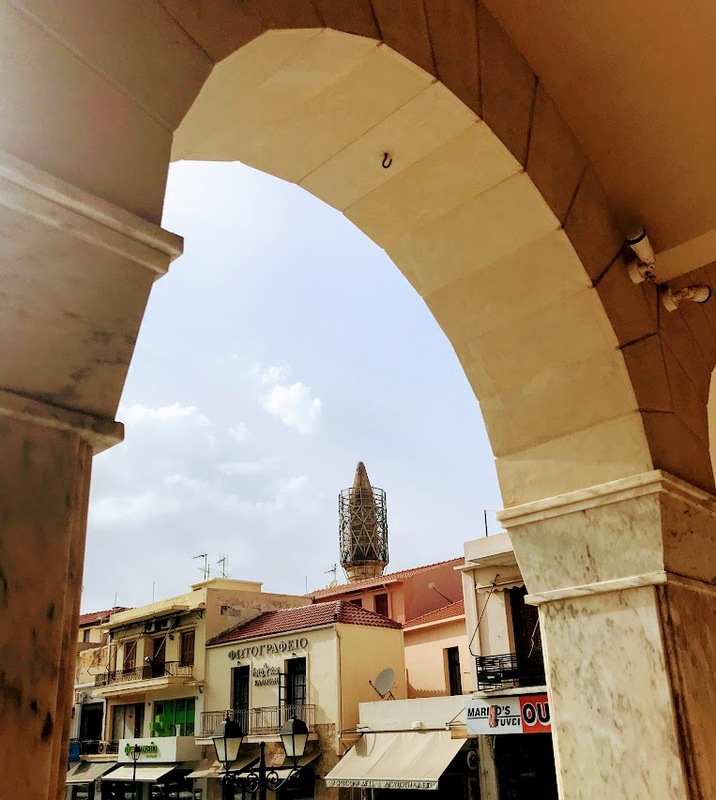 In the past, I have traced the mosques and minarets of Rethymnon, many of the hidden fountains and covered balconies, and the Venetian doorways. But I could find no signs for the former synagogues, Jewish Quarter or a Jewish cemetery. 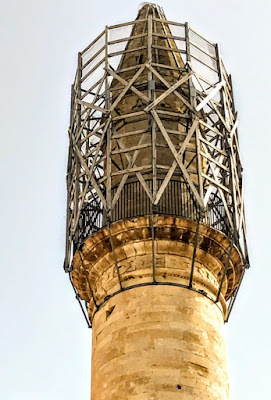 The minaret of the old Porta Grande or Valide Sultana Mosque behind the shopfronts on Tombázi Street has an inscription in Arabic and a sculpted Star of David beneath. The mosque stands near the Guora Gate, the main gate into the Venetian city, built by Jacopo Guoro, the Governor or Rettore of Rethymnon in 1566-1588. The mosque was built in 1670 next to the Great Gate and was later named after the Valide Sultana Kösem (1589-1651), the mother of the Sultan Ibrahim Han. Kösem Sultana, also known as Mâh-Peyker Sultan, was one of the most powerful women in Ottoman history, and the favourite consort and wife of Sultan Ahmed I (1603–1617). She was Valide Sultana or Queen Mother from 1623 to 1651, when Murad IV, Ibrahim I and Mehmed IV reigned as sultans. Kösem was of Greek birth, born Anastasia, the daughter of a priest on the island of Tinos. After her capture, her name was changed to Mâh-Peyker (‘Moon-Shaped’). She was sent to Constantinople and at the age of 15 she was sold into the harem of Sultan Ahmed I, who changed her name to Kösem. 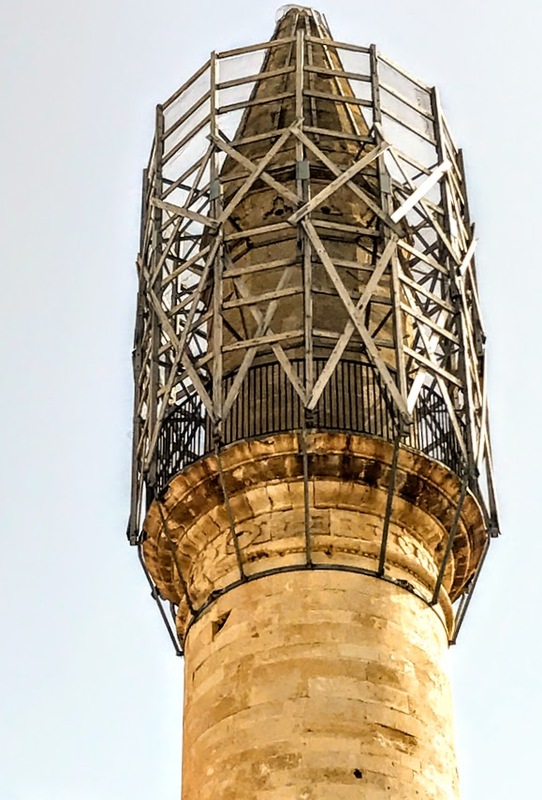 Perhaps the Star of David was included on the minaret because the mosque stood on the site of the original synagogue. 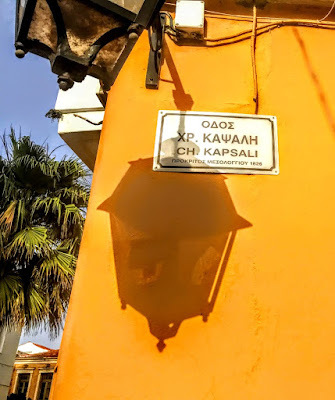 Close to the mosque, the name of Kapsali Street, off Tombazi Street, evokes memories of the Capsali family, one of the leading Jewish families in Rethymnon. Although there are barely more than a dozen Jews left in Crete, the Etz Hayyim synagogue has been restored in recent years in the Ovraiki, or Jewish Quarter, in Chania. Today marks the anniversary of the virtual annihilation of the Jewish community of Crete on 9 June 1944.